Arizona Power of Attorney is a legal document that appoints a specific person to act as a legal proxy if an individual becomes incapacitated in some way. For example, if a person is hospitalized after a car accident, this document allows his or her designated proxy to take over temporarily and administer their estate, deal with bank accounts, pay bills, and even make medical decisions if required. It is important to create power of attorney documents while a notary can verify that you are of sound mind to make the decision and are not being coerced by other parties. All forms should be written pursuant to Title 14, Article 5. Frequently Asked Questions (FAQ’s) – Provided by the Maricopa Superior Court. 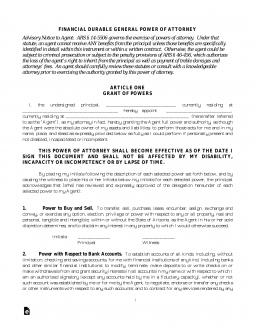 Durable Power of Attorney – If an individual becomes mentally incompetent due to illness or injury, it allows a grantor the ability to take over the finances or business interests until the principal regains their mental faculties. General Power of Attorney – Grants the agent the ability of someone else to be able to handle all financial matters on the behalf of a principal. Does not remain valid if the principal becomes not mentally able to think for themselves. Health Care Power of Attorney – Select any individual(s), family or friend, to make medical decisions if the principal cannot do so for themselves. Limited Power of Attorney – Limits an agent’s care of the individual to monetary matters. Minor Children Power of Attorney – Designates temporary guardianship over minor children for up to six (6) months unless the person is on active military duty, in which case they may extend that to one (1) year. Real Estate Power of Attorney – Allows an individual, known as an ‘Agent’ or Attorney-in-Fact’, to handle purchasing, selling, or managing real estate. Revocation of a Power of Attorney – Used to revoke power of attorney at any time, as long as they are of sound mind. Tax Power of Attorney (285-I) – Appoint a specific person, usually an accountant, that will handle all filings on behalf of an individual or entity with the Department of Revenue. Vehicle Power of Attorney – To handle title on another person’s vehicle and to engage in the buying or selling for someone else.